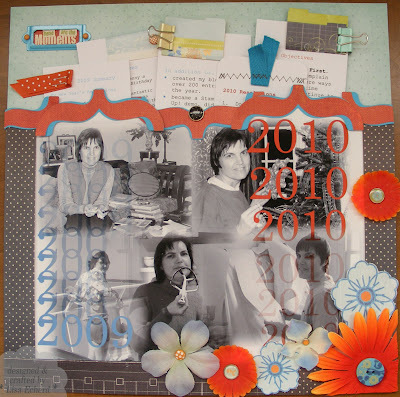 Putting pockets on scrapbook pages lets you store a lot of stuff related to your subject. I almost always have one pocket page per trip when I scrapbook our travels. The pocket will hold brochures, postcards, train schedules and other momentos that remind me of our trip yet I don't want to devote lots of scrapbooking real estate to them. Another place I use pockets is for keeping extensive journaling. This year's 2009 wrap up and 2010 resolutions are printed on several sheets of narrow white cardstock I've attached with binder clips, staples and other decorative fasteners. I can pull out last year's summary to see what went on during the year or easily refer to my resolutions and objectives for 2010. I find two challenges with pockets. First is getting the pocket sturdy enough the adhesive doesn't come loose. The two best options I find are to stitch the pocket with the sewing machine. This can be decorative stitching or you can cover it over with other paper and embellishments. 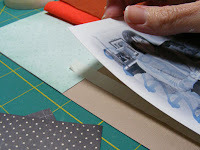 When using adhesive, Creative Memories photo tape is my favorite. Just be certain where you want it because it is immediately permanent. I haven't tried the red sticky tape. 1. 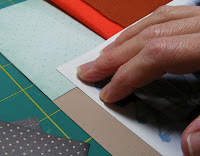 First, adhere the bottom of the pocket to your layout within one inch on each end. 2. Place the pocket paper (in this case my photos printed on matte paper) over a spacer. I used a couple of pieces of folded felt since I had some handy. (One would have probably been enough here.) You could also use a thin notepad. 3. Add adhesive to the sides carefully smoothing the paper down. Note: If you are working with a striped background, your edges are not going to look lined up. You may want to plan on covering the edges of your pocket with more paper, flowers or other embellishments. 4. Remove your spacer and you'll have lots of room for what the pocket is meant to hold. Ribbon: Polka Dot in Dusty Durango by Stampin' Up!